Despite its popularity, white kitchen cabinets are a non-starter for many homeowners. 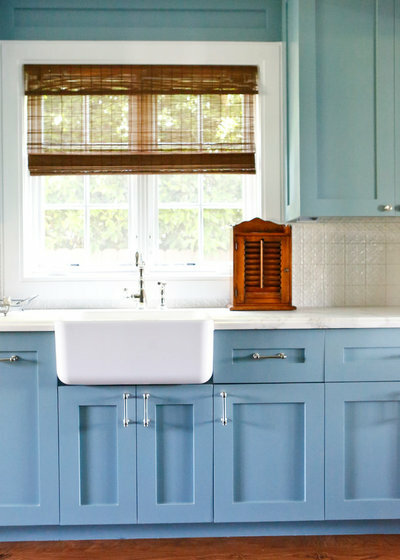 If you’re one of these, consider going with warm blue or blue-gray cabinets. 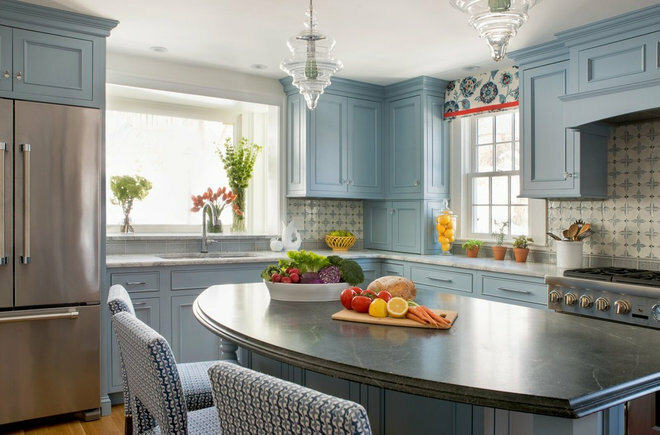 The following three kitchens show how refreshing, warm and joyful the color can be. Homeowners’ request: Update and expand a small galley kitchen to create a large family space with an island, lots of storage and natural light. Cabinets: The designers first selected the stones for the countertops — Super White quartzite for the perimeter, soapstone for the island. That led to the Pratt & Larson ceramic tile backsplash, which eventually led to the cabinet color (Winter Lake by Benjamin Moore). 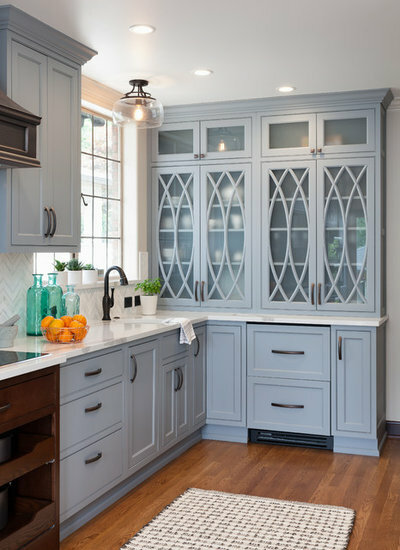 The cabinets are a full-inset Colonial door style with applied molding. Other special features: Appliance garage with foldaway doors. Hidden paneled refrigerated beverage drawers. Custom wood hood for a more traditional feel above the 48-inch range. Vertical storage above the fridge. Two-tier silverware drawer insert. Undercounter microwave and hidden pullout trash and recycling. Hidden electrical outlets to maximize the beauty of the backsplash tile. “Uh-oh” moment: “The first was regarding the stone countertops being the first chosen element for this kitchen on which everything else was built in terms of color choices,” Steinberg says. “We had gone to the stone yard and selected what was left of their textured ‘leathered’ or ‘pebbled’ slabs of this particular stone, which the homeowners loved. This was after going to see many other ideas and options. There were only so many of these slabs available, but we were happy and went on to choose the tile and paint colors. 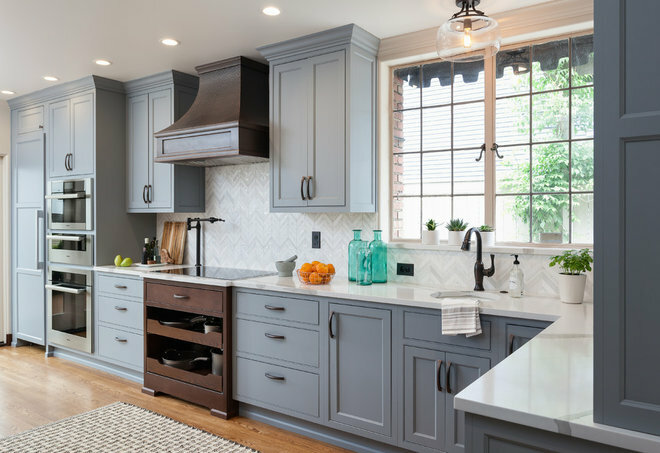 Homeowners’ request: Update a vintage Tudor kitchen with traditional cabinetry to honor the home and with contemporary finishes to fit their personal style. Cabinets: They’re an inset style with traditional details and crown molding. The color is a custom blend that includes Sherwin-Williams’ Steely Gray. 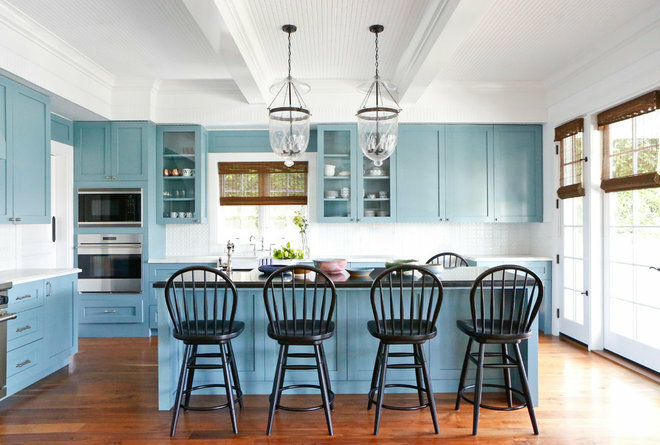 “The blue cabinets with a sand-color wall color creates a bright and calm feeling, and plays to the water views of this home,” says designer Heather Kirk. Other special features: Marble-and-shell herringbone mosaic backsplash. Refrigerator drawers. Open rollout shelves beneath the induction cooktop. Aged hammered copper hood. Glass upper doors with arched mullion detail. Pot filler. Homeowners’ request: For this newly constructed home, the owners wanted a comfortable, functional layout with transitional pieces mixed with family heirlooms. 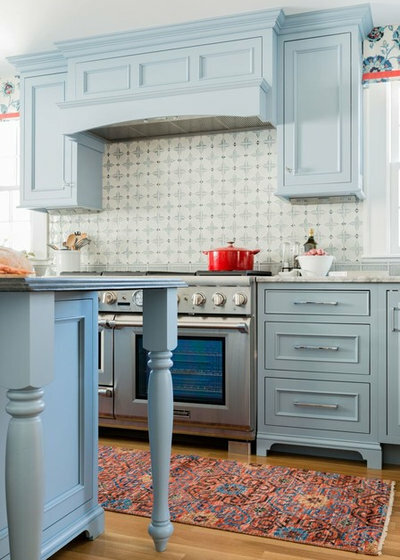 Cabinets: They’re a Shaker style in Farrow & Ball’s Berrington Blue No. 14. Other special features: Coffered beadboard ceiling. Natural walnut floors. Butler’s pantry. Appliance drawers. Farmhouse sinks. Honed Calacatta marble slab perimeter countertops with an ogee edge. Honed black granite island countertop with a mitered edge. Glossy basketweave-pattern backsplash tile. Polished nickel fixtures and hardware. Custom handmade bell jar pendant lights. Designer secret: “We spent quite a bit of time in the stone yards picking the right slabs with dramatic veining,” says designer Lara Sachs-Fishman.